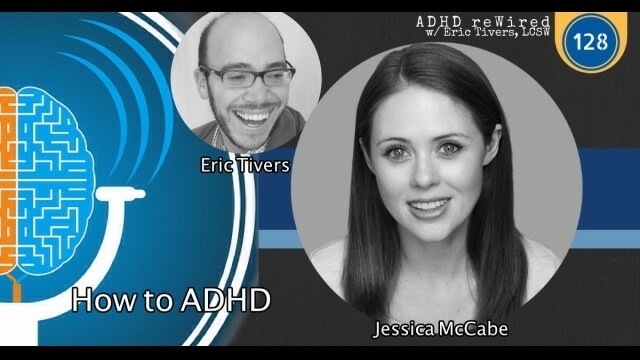 This week’s guest, Jessica McCabe, is the creator and host of the How to ADHD YouTube Channel. Jessica has ADHD herself, and discovered that medication is only part of the solution. Jessica created her first show as an ADHD toolbox. This was a friendly mix of useful tips and techniques that she shared based on her research and her own personal experience. Jessica says, “I make mistakes so you don’t have to.” Jessica provides her 10,000+ subscribers with new episodes every Tuesday. Jessica’s background in acting helps make her videos compelling and pretty clever. Jessica talks about her struggle (and unexpected success) with consistency in producing videos for the How to ADHD YouTube Channel. One thing that makes her feel comfortable in this area is the level of forgiveness in the ADHD community. People within the community appreciate the authenticity and we like to see that others struggle with the same things that we do. Jessica shares that some individuals find that she speaks too quickly, yet some appreciate the way that she speaks because they struggle with people that talk slowly. This illustrates that point that no matter what you do or how perfectly you do it, you’re not going to be for everybody. Jessica does get some feedback that ADHD is a serious topic and “no laughing matter.” She sees the seriousness of this topic, which is why she researches so much to try help things, but if you can’t laugh, it just gets too depressing. Jessica illustrates the humor of ADHD by telling a story about burning her face with a steamer. Jessica was a productive student in elementary school and chose to always have her nose buried in a book. She believes she enjoyed reading so much because she was bored by reality. When she entered Junior High, the added responsibilities of daily school life and independence magnified some of these ADHD symptoms. She was provided with medication and that was the only treatment, so she wasn’t learning how to manage her life. Jessica shares that she almost called the show “How not to ADHD” because she had a better idea of what NOT to do. Her boyfriend pointed out that might not be the best name and she’s glad she listened. This leads into a discussion on relationships. Jessica has a relationship history that she calls “not a pretty thing” and points out that this area of life one that does not get discussed enough in the overall ADHD discussion. She was always “good” at new relationships. Things were exciting and new. As those things changed and things weren’t as new and exciting, she would blame the boredom on the relationship. This is not an easy thing for Jessica to discuss, but this is important and worth sharing. When starting her current relationship, she was very honest about her bad choices in previous relationships. As an actress, Jessica struggles with memorizing lines and she has found some tools to help herself in this area, including an app. She also feels that being put on the spot is the best way to remember lines. Nobody wants the embarrassment of not remembering lines and this is a strategy that works for her. She also did a series on tricks to help improve working memory. Simply reading material is not the best way to learn. Jessica also shares how she’s used the Mind Palace strategy. She points out though, that not every strategy works for every person. A strategy that works for a person isn’t guaranteed to work every time. It’s about having a tool box with different strategies that you can implement. Jessica also talks about her struggles with to-do lists. She’s currently excited to use the app Epic Win. We challenge her to open her to-do list and share some of the overdue tasks on her list. As it turns out, correctly identifying the type of task something is actually helps with accomplishing the task and completing it. Another alarm that might help with accomplishing tasks is Freaky Alarm. Throughout this discussion, she realizes her resistance to these types of tools. She is afraid of being “boring” through routine. [6:35] – Jessica talks about starting her YouTube Channel, “How to ADHD”. [7:44] – Jessica expected to struggle with consistency and has been more consistent than she imagined she could be. The ADHD community is also very forgiving. [9:38] – Her biggest fear was that people would think she was wrong. She talks about giving herself the permission to make a mistake. [11:02] – No matter what you do and how perfectly you do it, it’s not for everybody. [12:06] – Jessica tells an entertaining story about burning her face with a steamer. [16:47] – Jessica shares her personal story and her ADHD diagnosis. [22:35] – “How to ADHD” or “How not to ADHD”? [23:26] – Jessica shares her relationship history, which is a symptom of ADHD that doesn’t get discussed enough. [32:33] – Jessica talks about how she has more satisfaction with what she is doing now compared to her career as an actress. [33:30] – The difficulty of memorizing lines trying to learn things that you aren’t invested in. [36:29] – We don’t have a terrible memory. Our working memory is challenged. [42:25] – Jessica talks about how she uses a mind palace to help learn new things. [49:15] – Jessica McCabe sits in the hot seat! She is struggling with having the tools, but not wanting to use them. Together, we work through this and find some solutions to this and other issues that Jessica is encountering in her life.